“Stranger Things,” Netflix’s dramatic sci-fi/horror sleeper hit, turned the world upside down when it premiered July 2016. The Netflix original series has received both critical and commercial acclaim, garnering 18 Emmy nominations and winning the Screen Actors Guild (SAG) Award for Outstanding Performance by an Ensemble in a Drama Series in 2016, becoming one of Netflix’s most-streamed original series of 2016. Unlike many sequels and sophomore seasons, the characters of “Stranger Things” do not undergo selective amnesia when it comes to the traumatic events of the prior season. The beginning of “Stranger Things 2” instead sees the characters grappling with their traumas head on. 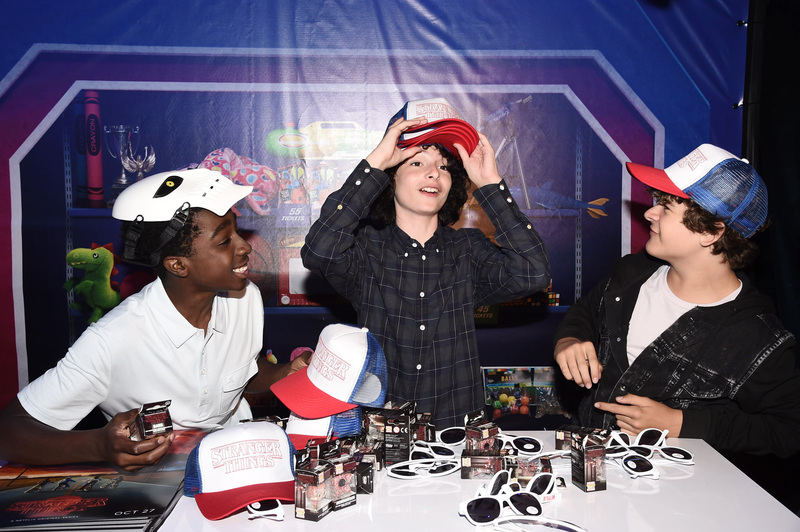 Will Byers (Noah Schnapp) sees a psychiatrist regularly to treat his recurring visions and flashbacks associated with his brush with death in the Upside Down, and Mike Wheeler (Finn Wolfhard) becomes sullen and withdrawn as he grieves for the presumed-dead Eleven (Millie Bobby Brown), the telekinetic research lab escapee who was his first love. Mike’s sister, Nancy Wheeler (Natalia Dyer), and her boyfriend, Steve Harrington (Joe Keery), wrestle with guilt over the death of their friend Barbara Holland (Shannon Purser), for which they feel partly culpable. Will’s mother Joyce Byers (Winona Ryder) struggles to connect with her boyfriend, newcomer Bob Newby (Sean Astin), in the wake of last year’s family trauma, and Sheriff Jim Hopper (David Harbour) is forced to assume a double identity to protect the town he loves. The internal character conflicts make for a season more gritty, thoughtful and satisfying than its predecessor. This season, the plot veers more sci-fi and fantasy than horror. Will’s “PTSD flashbacks” turn out to be visions of a new monster from the Upside Down, known as “the shadow monster” or “The Mind Flayer,” bent on destroying not just Hawkins, but the world at large. The monster possesses Will, an event analogized as a “virus” taking over his body, and the kids — Mike, Lucas Sinclair (Caleb McLaughlin), Dustin Henderson (Gaten Matarazzo) and newcomer Max Mayfield (Sadie Sink) — alongside the teens — Will’s brother Jonathan Byers (Charlie Heaton), Nancy and Steve — and the adults — Joyce, Bob and Hopper — must band together to stop the evil from escaping the Upside Down and throwing the world into darkness. Despite this season’s wider scope, it’s not as scary as season one. Where the first season showed little of its monster, relying more on Hitchcockian psychological horror, the second season leans heavily on its updated budget and relies on special effects for scares. The CGI is technically impressive but causes the season’s setting and atmosphere to lose some of the kitschy, nostalgic ’80s charm of its predecessor. Because the monster’s escape has implications for the world beyond Hawkins, some of the episodes take place outside the town. This ostensibly raises the stakes of the series; however, a large part of what contributed to the feeling of dread and suspense in the first season was the claustrophobia of the tiny town, the suspicion that there was nothing in the world but Hawkins, and, thus, nowhere to escape from the horrors which plagued it. With viewers reminded of the reality of the outside world in “Stranger Things 2,” that tension is lost. The season clocks in at nine episodes, opposed to season one’s eight. Although that number feels like an adequate runtime for this season’s comparatively weaker plotline, it isn’t enough time for adequate character development. To the show’s credit, it recognizes that a large reason for the show’s initial success was the intimacy of its characters and their relationships with one another, and for some characters, the show absolutely delivers on development. Dustin and Steve are a delightfully unexpected brotherly pairing, and when Dustin and Lucas meet a new girl at school, disinterested skater and supernatural skeptic Max, they vie for her affections with gestures simultaneously cringe-worthy and heart-warming. Most satisfying of all is Hopper and Eleven’s adopted father-daughter relationship, which is as authentic and messy as any parent-child relationship and brings out sides of both characters viewers haven’t seen before. Some character moments, however, are mishandled. The entire character of Billy Hargrove (Dacre Montgomery) feels unnecessary. It seems he was meant to have replaced Steve this season, who was reportedly so likable The Duffer Brothers chose to keep him on the show and expand his character rather than maintaining his first season characterization as the bully jock and killing him off. However, Steve’s character development worked not only because of Keery’s effortless charm, but also because the series simply doesn’t need a bully character. The show has enough internal and external conflicts that Billy popping up every now and then to torment someone feels superfluous. Instead of wasting time with Billy, the show ought to have focused on Mike and Eleven, whose friendship and innocent first love comprised a good chunk of the first season’s emotional core. The two are separated for the vast majority of this season, and their reunion, which takes place right before the climax, feels rushed (their adorable scene together in the last 10 minutes of the season notwithstanding). When a TV show is well-received, it’s common for creators to try to replicate the first season’s tone, plot and characterization while writing the second season in an attempt to duplicate that season’s success. “Stranger Things 2” took the opposite path, taking its storyline to unexpected places and making character choices that bucked predictability. That ambitious approach sometimes backfired — plots came to dead-ends, or character interactions didn’t jive as well on screen as they did on paper. Nevertheless, “Stranger Things 2” proved that “Stranger Things”’ success was not a fluke, and the series’ ability to reinvent itself promises much to look forward to in the future.